One of the most important things to learn to sail well is good wind awareness. It’s one of the basics, and something you can never stop perfecting. However, direction and speed is not all there is to learn about wind. When you start to sail faster boats, such as asymmetric dinghies (RS200, RS400, RS500), skiffs (Laser 4000, 29er) or catamarans, apparent wind is a very important concept. What is apparent wind? We’ll get onto that in a minute, but first let’s recap the important things about wind. The two most important things about wind, when you are sailing, are its direction and its speed. 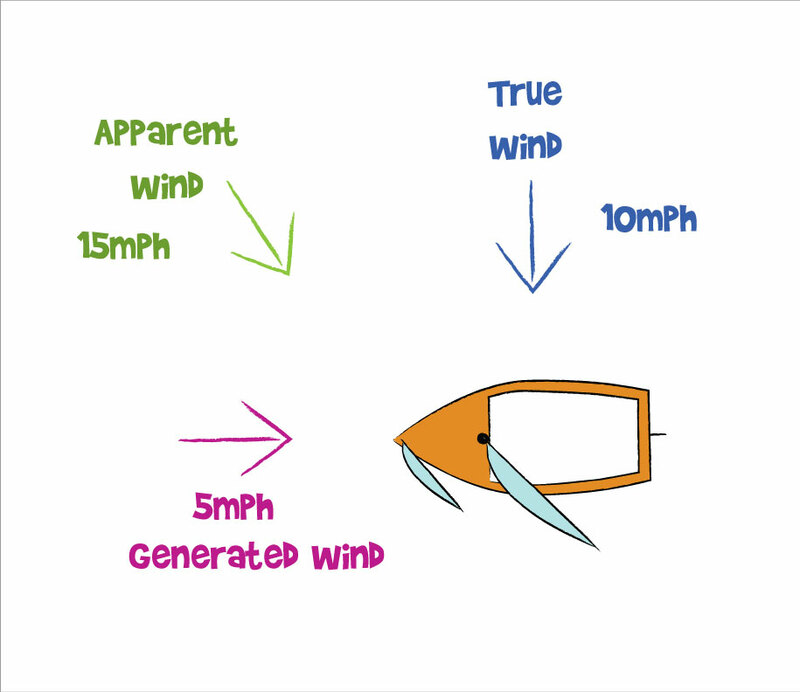 There are many methods of determining wind direction, both on land and on the water. Indicators on land you can use include flags, trees, or burgees on boats in the dinghy park. On the water, you can look at other boats (how they have their sails trimmed, if they are being sailed correctly), waves, or boats streaming off buoys or fixed moorings (unless there are tides or currents affecting them). You could also use burgees or wind indicators on your own boat – but as you’ll see in a minute, these are not showing the true wind. What is true wind? It is the actual direction the wind is coming from. When you are looking around for something to use to tell the wind direction, try to find something as close to you as possible, as wind can vary over distance. The other important thing about wind is the speed – but this is difficult to measure without a wind meter, apart from the relatively broad measurements of the beaufort scale (i.e. no ripples on a lake equals no wind, trees being blown over equals don’t go sailing). Imagine you are standing still on a day with no wind – you will feel no wind on your face. If you then start running forwards – you will feel wind on your face – this is wind that is generated by your forward movement. If you stand still on a day with a 5 mph wind coming from straight in front, you will feel that 5 mph wind on your face. If you then run forwards at 5mph, the wind you feel will be roughly 10mph, as you have the 5mph wind, plus you moving forward at 5mph, equals 10mph. This is the apparent wind. This example doesn’t cover sailing too well though, as you can’t move forwards into a wind coming straight at you. To put it in the context of sailing, imagine you are sat, with your sails all the way out, not moving forward, with a 10mph wind coming across your boat at 90 degrees. If you pull in your sails and start sailing, you will be on a beam reach. If you then reach a speed of 5mph, you will have a head wind of 5mph, mixed with a cross of 10mph, so as in the diagram below, the apparent wind will move forward of the true wind, and be a speed of roughly the two together, i.e. about 15mph. The important point here is that you will not feel two separate winds – they will combine, change speed, and change direction. What effect does this have on your sailing? Let’s continue the previous scenario. You start sailing on a beam reach with the wind coming across your boat at 10mph. As you speed up, the wind starts to move around and come more from the front – so your sails are now set for a beam reach, but you are actually more on a close reach or even close hauled point of sail, so if you now pull your sails in a little, you’ll get an extra burst of speed as you set your sails correctly. 1. The apparent wind is always forward of the true wind (unless the true wind is coming from dead ahead or straight behind you). 2. As the true wind moves around and is coming more from behind you, the apparent wind reduces in speed. The further forward the true wind is, the greater the speed of the combined apparent wind. 3. When the boat is on a beam reach or close hauled, because the true wind is further forward, the apparent wind is at a greater speed than the true wind. 4. When the true wind is coming from well behind you (deeper than a broad reach), a small change in true wind direction can make a large difference in apparent wind direction (especially when you’re close to gybing!). Some of what we’ve talked about so far may not immediately seem important, but skiff sailing (and also fast asymmetric boats) and catamaran sailing depend on apparent wind, particularly when sailing downwind. The design of faster boats or skiffs, particularly with asymmetric spinnakers, mean they sail slowly when going downwind, as when you sail directly downwind you cannot sail faster than the wind, and most dinghies will not sail as fast as the wind (some catamarans get close as they have less friction from two smaller hulls). The boat sailing downwind may only manage 5 or 6 mph top speed in a 12 mph wind. As you may expect, they will sail a lot faster when sailing on a beam reach, as this is the fastest point of sail. 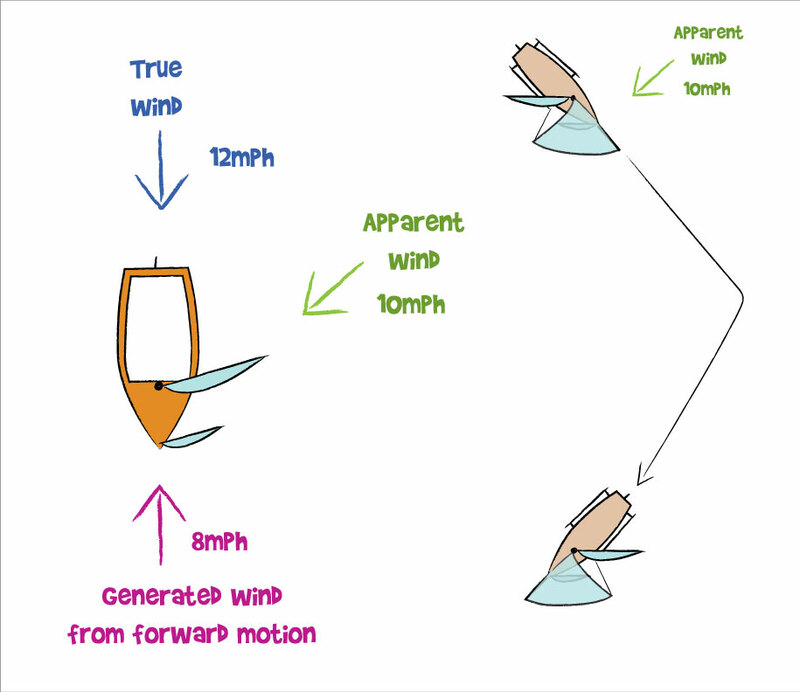 If you look at diagram 2 however, notice that when sailing downwind when the true wind is on a broad reach, the apparent wind moves forward (in relation to the boat), so the apparent wind is now closer to a beam reach. This is now a faster point of sailing than sailing directly downwind. A dinghy or catamaran, even though the apparent wind speed in the diagram shown is less than the true wind speed (10mph compared to 12mph), will manage a faster speed on a beam reach (particularly with an asymmetric spinnaker flying), maybe 8 or 9mph in a 12mph breeze), than it would sailing directly downwind. Why does this only work in faster boats, and not "regular" dinghies like a GP14 or Enterprise? Basically, they don't go fast enough downwind to change the apparent wind direction away from the true wind enough. The apparent wind effect does work in these boats - but is not as noticeable. The next question then is, if you have a somewhat typical triangular race course, and you are trying to make your way down the downwind leg, which is the best route? In an asymmetric dinghy or catamaran, a series of broad reaches, with gybes in between, is the ideal route. Why is this? Well, you’ll travel a greater distance than if you sailed directly downwind from the windward to leeward mark, but you’ll also sail it faster, and may well beat a slower boat sailing directly downwind. This is why the zig zag course is the “velocity made good” downwind in faster boats, as opposed to "course made good" from our 5 Essentials. Also, as an asymmetric spinnaker will actually continue to fly as high up as a beam reach, you can put a bit of variety in the course you take if you have more pressure over one side of the course than the other – for example, take a near beam reach over to higher pressure, then a deep broad reach down to the mark. Apparent wind is a tricky concept to understand, and even harder to get used to on the water. Above, we discussed the course of gybing a series of broad reaches to sail downwind with apparent wind. This can put into your downwind leg even more work than the upwind leg with tacking, due to the extra work required with a spinnaker, and also, require a lot of tactics, analysis and practise to perfect. Ultimately, if you plan to sail faster dinghies or catamarans, getting to grips with apparent wind is a must.